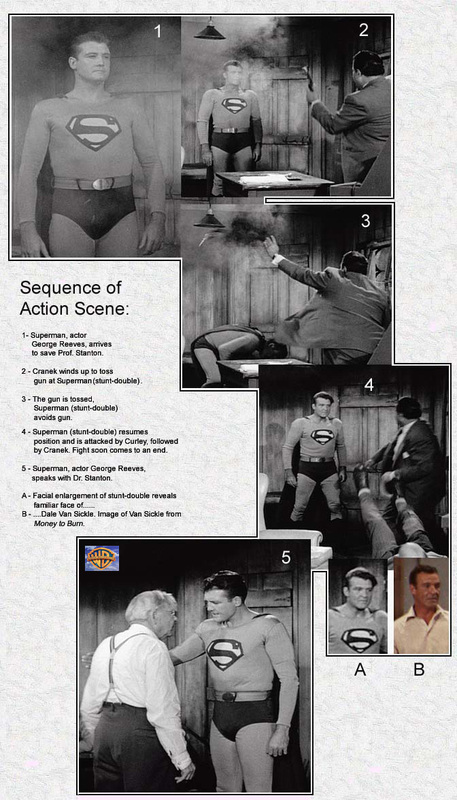 The beloved series the Adventures of Superman has often been criticized in varied circles for its low budget special effects. At times a wire carrying the Man of Steel over the Metropolis skyline is visable, when it shouldn't (see below). Little mistakes like this only add to the charm of the show. Especially knowing the production crew put their best foot forward with little they had to work with. Probably the most chuckled (or heckled) moment comes when the invulnerable Superman ducks to avoid being struck by a gun that was tossed at him by a bad guy. In all the epsiodes of the Adventures of Superman, this occured only once. Viewers of all ages in 1953, watching the first season episodes would witness the episode The Mind Machine for all its exciting and thrilling scenes, only to be slightly disappointed their new action star of the television screen did indeed avoid being harmed from a metal object. Of course, being a person first, the human reaction to something coming in your direction would be to avoid it. In most productions, a director would typically yell-out "CUT!" when an action scene didn't go according to plan. Everyone on the set breaks out into laughter. The director calls for a re-take, and "ACTION!!" But in 1951, working with a shoestring budget a second take rarely happened. TAC would like to take the opportunity to set the record straight as to who actually did the avoiding. A viewer has to wonder why did Dale Van Sickle have to duck in the first place, since Cranek, played by Dan Seymore tossed the gun mostly over his head. Dale Van Sickle bared a similarity to George Reeves, but only because viewers of the small television screen era didn't have the technology to question whether a replacement filled in for George. They were without the luxury of VHS or DVD stop motion capabilities or VidCap features computers offer today. Today's better quality television sets, not to mention their screen sizes no longer will convince viewers a stuntman filled in for the star. While Mr. Van Sickle looked like Superman, however he also moved less like Superman, at least not in the manner George Reeves applied himself to the character. Van Sickle's approach to the fight scene is very much like a bruiser in western saloon brawl scene. Watch the scene at your convenience and you'll likely agree. 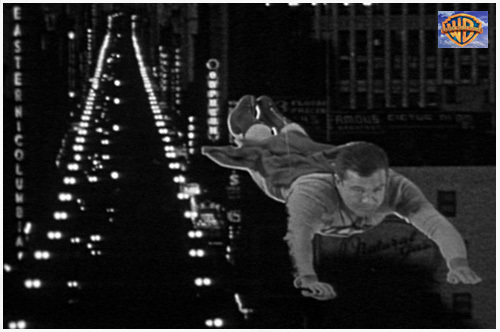 In the scene below, from the 1953 - second season episode The Man In The Lead Mask, it is obvious George Reeves, not a stunt-double. Here George Reeves takes the brunt of the gun tossed at him. Yes, he winces. Gosh, who wouldn't? Most likely, because a total of seven actors are called in for this scene, the director is going to push hard for one take. 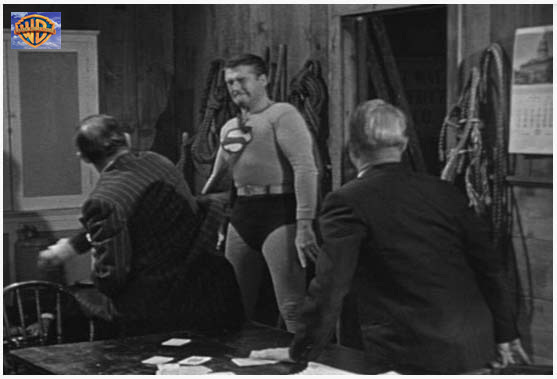 While Superman did indeed duck from the gun in The Mind Machine episode, it wasn't George Reeves. George most often preferred to perform his own stunts for the sake of pleasing the audience into believing in Superman. In the 80's, Jim Nolt visited Whit Ellsworth, the producer of the show from 1953 to 1957 at his home and Mr. Ellsworth confirmed the claim he couldn't keep George from not doing his own stunts. It's always funny, in the old westerns, whenever the crooks run out of bullets, as a last resort they toss the gun at their opponent. In Superman's case, if the bullets didn't stop him what makes the crooks think a tossed gun will? In the Johnny Weissmeuller film Jungle Jim, George Reeves unloads his revolver at the natives. When he runs out of bullets,....yep, he tosses the gun. I always laugh out loud at a Bill Cosby skit where he describes the Lone Ranger and his horse Silver are chasing the bad-guys. The bad-guys run out of bullets and always throw their guns, hitting Silver in the shins. Finally, after many bruises, Silver tells the Lone Ranger that's enough, he's not going to chase the bad-guys anymore. LOL.